This is really a book/movie review, as this short novel is an adaptation of the screenplay for the film of the same name. The movie was done the same year, here’s a link to its IMDb page, and you can treat this review as basically a summary of both the book & the film. I haven’t seen the movie in years, though I just read the book to my kids, and I actually have an interesting link to these projects. My wife’s grandfather, Albert Rezek, was the cameraman in charge of the animation. He shot the cells, and we actually have some of the original drawings that were created for the film. So there’s my connection to this story, and my reason for watching/reading something that is basically unknown otherwise, but should really be revisited as the trippy, retro classic it is. Raggedy Ann and her brother Raggedy Andy live in Marcella’s room, and they couldn’t be happier. All the toys take Marcella’s happiness as their #1 priority, moving around when she is gone but otherwise remaining perfectly still, giving themselves up entirely as playthings for the enjoyment of a child. But when Marcella receives a fancy birthday present from an aunt, the dolls’ lives will be thrust off track. The gift is a fancy doll from France named Babette, and when the captain of a ship in a snow globe sees her, he falls instantly in love. He captures Babette, escapes the playroom, and is off into the wide world. It’s up to Ann & Andy to get them back, return the room to normal, and start making Marcella happy again, which is all they really care about. 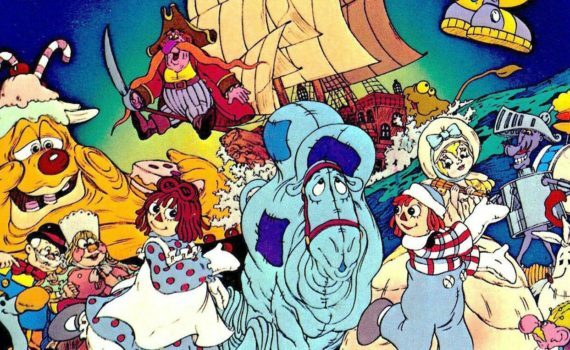 I remember the Raggedies from my childhood, though I never watched this movie as a kid. It wasn’t until my wife showed it to me later that I was introduced to this exact story, but I recall the dolls fondly, and now my kids will as well. The story is a wild one, though it starts out so plainly. It’s not until the dolls reach the outside world that things really get crazy, but crazy they get, and fast. Blue camels, insane monarchs, giant gloops of fudge & sweets, giggling knights, a sea monster with a hundred arms; you can tell this was made in the 70s. It’s silly, trippy, unusual, but lots of fun. The movie is a musical with a whole slew of songs, the book is more of a bare bones quick read, so enjoy both or either at your leisure; they aren’t masterworks by any stretch, but both are pure entertainment.